When they asked me to collaborate with this blog I asked what they expected from me to write about. The answer was very simple: “write about your field of expertise”. So here I am, ready to tell you quite a few things about… YEAST!!! Yes, you have read it right: Yeast. But don’t worry; this is still a blog about Science, not a baking one. And I won’t talk just about yeast, but also about other research done in the field I work in now (cancer) and can be interesting for you. I’m a yeast scientist and it has been like that for the last 9 years. We all know that the most common usage of yeast is to bake bread or brew beer. Or if the yeasts are more complex (fungi) are meant to be eaten (like mushrooms) or to annoy you on your feet (fungi infection). But, actually, there is much more behind one simple yeast. This organism has been used in biomedical research for decades already. Why? It’s simple: it’s a simple organism that is easier and cheaper to work with than other cells or organisms. At the beginning of my career as researcher I was working with yeast to identify new therapeutic targets in fungal infections. These infections are not severe in general but they can turn into lethal ones when the patients who got them have an immune system that doesn’t work properly (i.e: lymphomas, AIDS…). Therefore, the immune system can’t fight the infection and it ends up causing additional problems to the patients. At this moment, the drugs against fungi and yeasts are not very efficient because of the similarity between yeast/fungal and human cells. Actually the existing antifungal drugs have two main problems: 1) they are not specific enough against fungal cells so they will kill not only the fungal cells but also the human ones causing severe side effects, and 2) to not cause side effects, these drugs are not potent enough to kill the fungi. 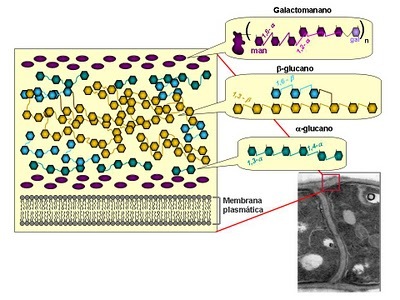 Because of this, studying the different structures between yeasts/fungi and human cells (i.e: the cell wall) is required to develop new and more efficient drugs against fungi. However, only around 10-20 percent of patients who get a general fungal infection have their immune system somehow defective. The majority of patients get these infections in the hospital. Hospitalized patients are more susceptible to these infections because of different reasons. For instance, the use of high amount of antibiotics that wipes out the bacterial competitors or surgery and use of intravenous catheters that will allow fungi to have access to the patients tissues. In this case the immune system of these patients is intact and will generate an immune response to vaccination. Therefore, another kind of projects that use yeasts and fungi to do research are aimed to create vaccines to avoid these infections. On the other hand, nowadays I’m involved in research projects that use yeast for other aims. Yeasts are the simplest eukaryotic organisms. They are unicellular (they are just one cell and don’t form more complex organs) and have many of the proteins that can be found in human cells. These proteins are in charge of the functions that one cell needs to be alive. Therefore, yeasts can be used to study processes happening in human cells. This is due to the fact that the important proteins are the same in both kind of cells but they are “more accessible” to study in yeasts. For instance, yeasts are used in the study of some of the processes involved in the development of cancer. This is the kind of research that I’m currently doing and it’s fascinating. Cancer is a group of diseases that have an uncontrolled cellular division. 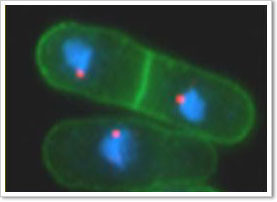 In the cancer cells the processes controlling that everything happens when and where it should happen for the cell to divide into two new cells don’t work as they should. Usually, the important proteins in these processes are in a higher amount than they should and this causes many problems to the cell. These key proteins are present in yeast and other lower organisms as well. 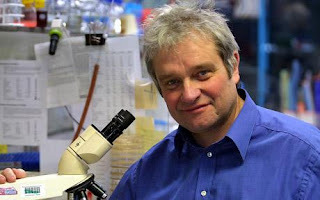 For instance, the discovery of the protein that tells the cell to divide in the fission yeast gave Sir Paul Nurse the Nobel Prize in Medicine in 2001. He identified a protein called Cdc2 in the fission yeast that acted in collaboration with another protein called Cyclin (because the amount of protein during the cell cycle was different in different stages) to push the cell to make the decision of dividing into two. This Cdc2 protein in higher eukaryotes (like humans) is called Cdk1 (Cyclin-dependent kinase 1). The stunning experiment that made Paul Nurse get the Nobel Prize was a very simple but powerful one. He took one fission yeast that had a defective Cdc2. In this yeast at low temperature the protein was working well and the yeast was alive. But when the temperature was increased the defective Cdc2 stopped working and the cell was dead. Once he had this yeast where he could switch off the activity of Cdc2 by rising the temperature, he introduced the human DNA chopped in small pieces into the yeast, increased the temperature and looked for any cell with a piece of human DNA that at high temperature was able to be alive. And there was one. What happened in this one cell that was alive is that, even if its Cdc2 wasn’t working, it got the human equivalent. And this “human Cdc2” was able to work properly in the yeast cell because both, the yeast and the human Cdc2, were very similar and had the same functions. He identified the Cdk1 protein in humans!!! I hope I’ve convinced you that doing research with yeasts is useful and important. I will keep telling you about some discoveries made in yeasts, among other organisms, that have been important steps to advance in the scientific knowledge in my next posts. Colorectal Cancer is the second largest cause of cancer death in the US. Are you at risk getting colorectal cancer? If you know the associated symptoms and risk factors associated with this bowel cancer, you will know if you are at risk.